Celebrities hunt for antiques across the UK. 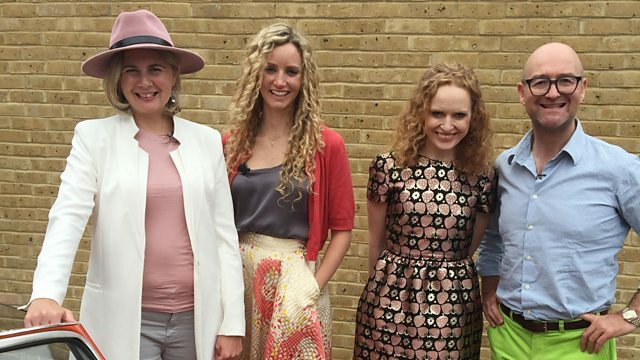 It is a journey into antiquity with historians Suzannah Lipscomb and Kate Williams. Browse content similar to Suzannah Lipscomb and Kate Williams. Check below for episodes and series from the same categories and more! If I do that in slow-mo. Suzannah Lipscomb and Kate Williams. -It does feel Thelma And Louise. -I do want to pick up a Brad Pitt. he knows much about antiques, though. -That's not what we need him for. We need an antiques expert. We need to have a chat later, don't we? And chat they might. These two have been chums for years. So when did we first meet? -I think we first met at that History Today party. -They do have the best parties. to our little trip away to France. -Our holiday away together last year. august academics, and regular presenters of history documentaries. helping to bring the past to life. Suzannah's specialism is the 16th century Tudor period. from whom she seems to have been taking some tips. -Gosh, it is a lovely car, though. -It is an amazing car. Did you just wave like the Queen...? The car brings it out in you. is a 1968 Renault Caravelle. David Harper and Catherine Southon. I'm always happy with you, David. -Oh, and it's so good to be with you, Anita. Oh, I'm sorry, sorry, I was living in a dream world. Today, these two are driving a 1973 Triumph Spitfire. to do battle at auction in London. And what a battle that's shaping up to be. I think you're sweetness and light. And yet I think that actually, underneath, you're deadly. but under it is a brutal beating heart of competition. See, this is what I said, I thought you'd be competitive. to a game in which people end up killing each other? -Look at the amazing car. -Very nice. Hello. How exciting. You two look very good against that very posh car. It's a nice car, isn't it? We've done well. I don't think he's looking at the car. -Would you like to take the driver's seat? -I can have a go. I'll open the door for you, at least. I've been trained. Enjoy yourself, you two. And you. Don't spend too much. Time for these newly minted teams to size up the opposition. Now, come on, Suzannah, dish a little bit of dirt. What's Kate going to be like? So, Kate is one of the loveliest people you'll ever meet. But she is a prolific author. I haven't even heard that she's making. -She's got an inner core, you know? because my mum was completely obsessed with these cars. So your mum was fascinated by Spitfires? She dreamt of a Spitfire, it was her dream car. And so I spent a lot of my childhood looking at them. They became an object of desire when I was a child. So that's wonderful that we're living your mum's dream. they're heading for the town of Bletchley, Buckinghamshire. They're aiming for their first shop of the trip, Fenny Antique Centre. Careful how you say it. Well done, brilliant, we are here. -Yeah, I'm ready. All set. We've got shopping to do. You certainly have. And assisted by dealer Mags. We can make a potion in here. -And we could poison the other team. -We could poison the other team! What about silver? A little trinket box. -Heart-shaped trinket box. That's quite nice. -Easy to fit in your house. AND just inside Kate's Victorian era of specialism. We could get that for cheaper, couldn't we? Time to call in dealer Mags. Mags? Mags? which adds to it because it's my hometown. -So it's a Brummie box. All the flowers and the foliage and the swags. -But what can Mags do on the price? -I think we need to go down a bit. I think 25 is where it wants to be, if we want to make some money on it. -"I really want to be £25." They'll take that, and no mistake. Deal done. may be a bit trickier. David and Suzannah need to come up with a plan, me thinks. Stand by. We see a lot of 18th and 19th and early 20th century pieces. because they're the things we're used to handling. It would be fantastic to find something from that period. But I think, with your help, we might get it. Well, that would be a total thrill. I would be ecstatic. So, they've set themselves a high bar. as they aim into their first shop of the day, Lawson & Lee. -Well, Suzannah, here we are. Welcome to my world. So, what are you drawn to naturally? Well, naturally, I'm drawn to the books. So, straight to the books they go. I'd definitely be getting this one. Look at that. -So, tell me why you love that so much? so immediately this is a great source. a book on her own specialism, 16th century history. though it was published in 1846, so it does have some age to it. "that have ever been accomplished amongst men," he says. -Anyway, so I think it looks kind of cool. -And I would definitely get it. But I don't know much about the market of these things. But you do know a man who does, Suzannah. The condition is good, originality. I mean, it's well over 100 years old. The gilded pages are lovely. and there is a book that so relates to you, it's unbelievable. This is a sign, it's a sign. Can we keep it as a possibility and see what else is here? -Oh, you're not an easy shopper, are you? -do you put things aside and go and think about them a lot? Oh, dear. OK, all right, now I know what I'm in for. It sums up you! I'm amazed that you're not desperate to buy that. but I'm not desperate to give it away to anyone else! until they've searched the rest of the shop. It's just... It's cool and trendy, that's it. Is that a way of you saying that you don't actually like it? It's a piece of retro glassware, probably dating from the 1960s. I better put it down. So you wouldn't put that, then, on a 16th century coffer? -No. You wouldn't do that. when I think about that, actually. Being a historian, you end up liking the stuff from the distant past. -It's a no-no to retro, then. and look at that book on the Reformation. and the auctioneer will do a really good job. and a little thank you from you for purchasing the book. -Just slip it inside there, it may help it. -Can I tempt you to have a go at it? -the red and yellow monstrosity. -Yeah, which one would you go for? -I think we'll be going with this one. -Would we really? OK, OK. But can Suzannah secure a good price with dealer Claire? I'm going to put you right on the spot. -and I need you to do a deal. It was priced at £15. Erm, could you drop it to ten, please? Hm, I don't know whether she believes that! She looked at me and thought, "No, I don't think so. -Very well done, very well done. Deal done, and their first purchase is in the old bag. for shiny items of interest. Is that an ostrich or an emu? It looks a bit like an emu. It's more of an emu, isn't it? mounted as it is with an emu and a kangaroo. It's a lot of money. £110. It says 110 or best offer. Best offer, eh? That sounds hopeful. so Catherine will put in a call. Mr Stewart. Mr Stewart, hello, it's Catherine Southon here. Hello. Thank you very much for taking our call. What would be your very best offer on it? OK. All right. OK, I shall have a word with my colleague. -He's had it a while. -Which is a bit of a drop. means it's definitely a strong contender. because she's spotted yet another shiny piece of silver plate. Oops! I had a friend at university with a samovar. She used to give us nonstop bubbling tea. the way that that's really decorated. Another Victorian item takes Kate's fancy. traditionally used in Mother Russia. so they'll need to have a word with dealer Roy. -Sir? Might you be the owner? -We've seen something that we quite like. -Can we look in here, please? -Wouldn't it look nice in a sort of teashop or something? It would look the business. may have been knocked off the top. Could that be the angle to secure a better discount? To be honest, I think it's a risk for us, isn't it? and then we won't ask any more? But they have the inkwell in mind, too. Those two items are now offered at a total of £125 combined. -What I'm suggesting is, can we offer you 120? I'm glad you can add up, Catherine. That's only £5 off. For the two. Poor old Mags, that team certainly know how to bargain. That's three items in the old bag already. literally, tangibility with the past. you know, 500 years ago, 400, whatever. Mrs Beeton's Book Of Household Management. Ha! of Mrs Beeton, Kathryn Hughes. Do you like our ride? Not quite Victorian, but almost there. of the ultimate Victorian domestic goddess, Isabella Beeton. a hit on a scale that would put today's lifestyle gurus to shame. So, what sort of things are in it? So everything you might need to know. not just cookery - everything. How to splint a head. How to get stones out of horses' hooves. How to save somebody from something called apparent suffocation. Anything you could need to know is in there. I have to put it down because it's actually very heavy. on everything the up-and-coming Victorian housewife might need. as well as her famed recipes. is that she's writing for people who have exactly this kind of kitchen. So she's not writing for very grand people with large staffs. a sort of Downton Abbey territory. She herself came from quite a modest family. certainly didn't have a professional cook. That information must have been out there in different guises. Was she the first person to compile it all in one easy-to-use book? a curator, if you like. and then she puts it together in one digestible kind of package. This easy-to-use formula proved to be a real winner. How many copies did she sell? she might have sold 60,000 copies. it looks as though it's probably the most successful book bar the Bible. the real story of Mrs Beeton's life is little known. So, who was this woman, where did she come from? of, I don't know, about 55. -It's definitely the idea of her I have in my head. -Older, I would say an elderly woman. Stout, a little bit of a dragon. -when she started work on it. She was 25 when it was published. -And, very sadly, she was 28 when she died. that evolved to become the Book Of Household Management. taxes had been lifted on certain kinds of publications. these really, really large books quite cheaply. meant they found an eager audience of young housewives. very clearly, because that was very, very important with the recipes. Prior to her, recipes tended to be terribly vague. Cookery writers would say things like, "Take some flour." and sadly you didn't have them. she's writing for women who don't instinctively know how to cook. over the following century and beyond. but, strangely, you know, she still lives on because of this book. Meanwhile, Kate and Catherine are enjoying the Hertfordshire scenery. Going on this amazing '50s trip through the countryside. -I feel like Bridget Jones going on a mini break, it's amazing. where they're aiming for their next shop, Past And Present. Kate likes something that tells a story. Where we can look at it and we can think about its history. -I like things that have a story. -About where it's come from. Yes. with a bit of a local tale to tell. Have you seen the basket on the floor there? I have seen that. I did actually just look at that, actually. It's from a business in Hitchin that was called Letchworth Hill Laundry. -And they did laundry for years and years. -Yeah, ticket price on that is £70. I think 70 is steep. I think it's very steep. -We could maybe do a deal with you? While Michelle looks into that, they'll keep browsing. In life, you can't afford everything you want, can you? I wouldn't mind a yacht with a hot tub, but I can't have one. You're right. Let's carry on. This is Royal - Royal Albert. and written on the Queen herself. So I have a lot of royals in my life. and it's still trading today. This cup and saucer dates from the mid-20th century. There's no ticket, so Kate will ask Michelle for a price. We'd have to go much lower than 15.
and so it would have to be £5, wouldn't it? Oh, you push a hard bargain. OK. Do you want to do a deal? but will keep looking for more treasures. with these beautiful blue bone handles here. What else has Kate spied? This is sort of weird. Oh, gosh, I could've... I saw that dropping then. and is marked up at £20. -Well, it's a bit horrid. But I think it's so horrid it could be good. Do you know, you're right. the knives, and now the vase. Would that be too weird? No. All that stuff combined is currently sitting at £115. to the very, very, very best price for the lot. -I think I've done you a deal. -I think that's got to be the answer. -It's so wild it might just work. So that whole bundle of stuff will form one auction lot. Gosh, let's hope the gamble pays off. frantic, fun-filled frenzy of buying. off the trail for long - oh, no! The morning sun finds Suzannah and Kate ready to do battle once more. So, how was your day yesterday, Kate? It was really fun, we got some things. Well, I think I learned a lot, actually. There's quite a lot of pressure on today to get lots of good things. I feel the stakes are high. -We had a really good day yesterday. Well, there's no stopping Kate. Her first bit of negotiating was effortless. and the job lot of vintage items, including the linen basket. They have £190 left to spend today. they have a whopping £390 left to splash. -Beauties, I love them in this car. -You really suit this car. -I can get used to Suzy driving me. Are you ready for another day of madness? Let's get this show on the road, then! Huh, the car's conked out. Looks like they'll need a push-start. -and then we'll bump it. David's such a gentleman, isn't he? -Are you doing this as well? -There we are, that's better. You haven't got very far, have you? -"Oh, dear", you're so sympathetic. Do you want us to tow you? -Yeah, that would be great, thanks. Yeah. -Shall I get the rope out? I'm sure Suzannah and David will figure that one out. Kate and Catherine are feeling competitive. If I was being really hard-headed about money, what should I get? I think, yesterday, we were buying things that we really loved. and think about what is really going to make us some money. and it's game on with them, too. given that they abandoned us in our car. as they drive towards the town of Dunstable. and there's one country she loves to visit above all. How much time did you spend in India? -I spent... Oh, I've been there seven times. -I love it so much. -And, I mean, glorious things, the artwork. It'd be amazing if we could find something Indian today. Well, that's something that we'll look out for. With that thought in mind, they're motoring to today's first shop. Look at this! I mean, stuff pouring outside. Oh, you're straight in. -Oh, I say! What are we looking at there? Suzannah's straight to an object once again. rather than the modern things. Doesn't it look amazing? It is absolutely amazing. Is it Silver Cross? -Is it actually THE brand? -Is that a special brand for prams? and lays claim to inventing the world's very first baby carriage. This is probably a mid to late 20th century example. -It's in really good condition. Is there a kind of retro interest? and strolling inside to meet the dealer, Richard. -Hello, how are you doing? Pleased to meet you, Suzannah. I'm Tim. This place is absolutely stuffed. -Does it make you feel daunted by seeing so much stuff? -I want to get going. -Nothing scares you, actually, does it, really? -There are no heights involved. No heights involved, OK, only lows. Well, no, we're going to have some highs as well. We're going to find some good stuff. High quality, low ticket is the name of this game. -Well, another nice-looking thing is this brass tray here. Definitely Indian. Now, that's got age, I feel. -Do you want to have a look at it? I think this is a thing of beauty. they've alighted on a brass tray from that very subcontinent. OK, tell me about this. Why do you love it? Just the delicacy of the carving. I mean, yeah, it looks just like a fine thing. -I mean, it's a beautiful thing. -I think this is the period of the Raj, isn't it? -We could make a tray of delights. Something else, though, has caught their attention. OK, that is seriously for nothing. I mean, it's an incense burner. It's not fabulously old, but it wasn't made last week. ticketed at only £12 and probably hailing from east Asia. -It could be... It may be Buddhist, then. but it's got the look. 12 quid, we should be running out with that. -That might be quite nice with our brass tray. -Do you fancy that tray? -I really like the tray. -And I really like that. So, with tray and censer, off to Richard they trot. Ticket price on the two combined is £30, so watch out. -How much are we going to pay you for them? -Er, £30 would be good. But if we weren't to pay you £30, what would you accept for them? I think 25 is where I'm at. But will he go any lower? -You didn't even have to speak. I just had to stand here and exude this sense of reprimand. Deal done there, then, but David's still on the hunt. All right, I can't keep my hands off proper period furniture. early 19th century, c18th century, the Regency period. It screams it. These shelves are priced at £18. and I think this is the first real antique I'm going to show her. And so he'll corral Suzannah and Rob, the dealer who owns them. -I think they're ridiculously cheap - and I shouldn't be saying that. but I can't help it. I'm out of control. -It's a very good price. -Tell him it should be more. You're really bad at this negotiating lark. I know, I don't know what's happened to me, yeah. -What do you think, Suzie? -I think we take them for £15! Shall we have them? Shake his hand, we'll have them at £15. but they've still got an eye on that classy vintage pram outside. It's marked up at a substantial £180 - nothing babyish about that. In auction, it needs to be well sub-100. It really does. Are we going to get well sub-100, Rob? The best I can do is 95. I think that's a good buy. -There's a twinkle in his eye, though. I think there's a bit of flexibility there. -I'll shave another fiver off. -I think you'll do well on it. That's a very productive shopping excursion. Can I get my shelf unit in there? I might as well let you do that as well. How's that? -OK, you hold it steady. -And I'll guide you through. That's it, to me. Always the way, isn't it? Always the women's work. Always the way! At a distance, I'm quite embarrassed at this point. so they're taking a break from buying. What does it feel like, driving this amazing car? -But it's also quite sporty. I feel quite sporty. going along together with the palm trees and the top down. Well, they're not in LA! But they are aiming for sunny Luton. where they're meeting Luton cultural head of collections Elise Naish. Oh, my goodness! Oh, I love it. These are incredible! and it was the millinery industry that transformed this town. It was one of the key industries here. working around in the town. -it's quite easy to get to London for the shops. -for sending London hats to Paris. and this had a terrific impact on the local area. -I'm guessing the population grew. were employing over 1,000 staff. Were other countries competing, or was it all about the British hat? No, there were other countries competing. -and see what they were producing. -I'm going to be a hat spy. they would work out what was fashionable, what the colours were. You wouldn't believe the sneaking that went around. sent in to get ideas and nick the patterns. -in terms of that sort of thing. the industry kept one particular part of Luton's population in work. because just look at the workmanship on there. Amazing. And a lot of it would have been a lot of women, I presume. -were actually run by women. -So the women were the breadwinners. -I really think they were. Oh, cos of all the hatmakers? This is the place to look for a girl. a trend that continued right up until the post-war period. -But in the 1930s, Luton was producing 70 million hats. -70 million hats a year. There's not that many people in the United Kingdom at that point. you had your special-occasion hat. -No, it wasn't just one. and have the latest model as well, too. And Luton's milliners are still at the fashion vanguard today. and Kate and Catherine are visiting one of its most venerable. how a felt hat is made. and shapes it over a heated aluminium block. the felt will gently dry. This gentle drying process gives the hat its shape. Now is the time to take it down. It's all about precision, isn't it, here? You've got to be very careful. -Yeah. So, now it's a lot firmer. Oh, it feels... Lovely, and nice and warm. A nice and warm hat. -It's like freshly baked bread. That is lovely, isn't it? -And this process has not changed in centuries. -This is how we've always made them. can't leave without trying on a hat or two themselves. There you go. Now, there is a mirror just over there. for another item, and they're heading to their next shop. It's all in the hunt. What we are today, Suzie, we're treasure hunters, yes. We are pirates - pirates of the antique shops. which today has quite a crowd. Oh, you're all out enjoying the weather. Very nice! -Good to meet you all. -Which direction are we going? Don't worry, it is vintage and very dusty. I'm sure that should be worn at an angle, shouldn't it? -There's one behind for you. -Oh, right, OK. Oh, yes! as Kate and Catherine have now caught up. Can you hear them? Let's move, move, move, move, move. You can come in if you want to, but it might be a bit scary. -What are you doing amongst those clothes? What are you doing? -I gave the game away, I didn't hide very well. -That was such bad hiding. -Anyway, lovely to see you. -Oh, yeah, great to see you. -I'm not trying to avoid you in any way. -We're not hiding or anything. -I think you should go over that side. That side looks like it's got so many things. -I think you should go there. -..they don't want us around. -They don't want us here? -Was it conveyed subtly enough? I think they got the message. It is a jamboree, jamboree emporium. Look at him! It is an ant menu-holder. This large metal fellow is ticketed at £150. Gosh! Don't you think he's kind of cute? Little friendly person who'll offer you a menu? No, "cute" doesn't come to mind when I look at that. Nasty! So, Catherine's well and truly put the kibosh on that. -Oh, Catherine, what do you think about that? Catherine, have you just approved of something I've come up with? '50s. -I mean, I wouldn't use it, but I think it's lovely. Cranberry and gold water set. I like that. I could use that, I think it's really pretty. has been lost from the set. They might be able to negotiate a knock-down price from dealer Eric. It does say on the ticket five, and there's only four. -There are only four there, yes. -So, could that be, what, ten? -Thank you, Eric. Great doing business with you. -Thank you very much, bye-bye! or are they just messing about? Puts you in the shade, doesn't it? that no-one's ever seen before. -Now, that is outrageous on so many levels. -You're right about the ant. Oh, I see, that makes sense. It's a menu-holder. That's very cool. but this time it's our celebrity who's unconvinced. This is the ANT-iques Road Trip. -It doesn't want to be. It really doesn't want to be. "Look, how long have you had the ant menu-holder?" "I don't know, as long as the antiques centre's been here?" even though he is a genuine ant. and remember that they saw a metal ant menu-holder. Now, I've come to trust you in the last couple of days. Do you genuinely think we could sell this? He does. So David will go and speak to the dealer. You get to know and get to love the ant, whilst I find a human. That's a really alarming thing to say. It's a weird creature, but increasingly endearing. Are you talking about me or the ant? Right, I've spoken to a human. and, not surprisingly, the ant has been here for a very long time. I think we can see that, yeah. -OK. Now, we can buy the ant, 50 quid. That's it. I want that ant. Do you want the ant? -OK. Let's get the ant. -Shall we have the ant? We've bought an ant. You've bought an ant on the Antiques Road Trip. Yeah. I'm quite anti, myself. Now, both teams have all their items for auction. It's time to unveil their purchases. Shall we call our collection eclectic? Eclectic is certainly one thing it is. -Yes. Ant-ique is another thing. -Do I spy an ant? Did you buy the David ant? -Are you ready? There is the ant. -And then we are going to go like this. -When does that date from? -I think that's probably 1970s. -Has it ever had a baby in it? It's pristine. -No, it has been used. It's got patination. -Don't forget our other beautiful things here. -How much did you pay for the pram? -How much did you get the pram for? -I really like the pram. -What did we pay for the pram? 90. I really, really rate that. The pram is very popular. But what of their other items? This was our first purchase. You couldn't have chosen a more apt item. -Look how beautiful it is. So it's 1846. And it's a history of the Reformation. -So it's all about Luther. So it's about the 16th century. which is, "Thomas Rogers, the gift of a young lady." I think that's very well-suited. -It really is. You couldn't get better, could you? But what will Suzannah and David make of their opponents' haul? I have exactly that teacup at home! That's quite a coincidence, isn't it? But what about the rest of it? -It's her. She doesn't stop. -The vase, it seems, is not a hit. -It competes with the ant for weirdest thing ever on the Road Trip. -There's a charm in ugliness. -Yes, but you say you love it. -I do love it. It's wild and wacky. Says the man in the peppermint-green trousers. Are you selling one, two, three, four objects as one lot? -That's really good for us, by the way, just so you know. What do they make of the massive samovar? That would have been rather good, wouldn't it? Missing a finial, I see. We are miles apart, and we wish you the very best of luck at auction. I'm sure you do. I'm sure you do. We'll see you at the auction. But what do they have to say when their opponents' backs are turned? Well, I love the pram. I think that could go for a lot of money. -OK, their stuff - what's your favourite of theirs? but I think they've paid for it what it's worth. so we have to win because you're a genius. -Maybe I'm just getting attached to it now. it's almost time to put the first hammer down. in the north London area at Southgate. Suzannah and Kate have commandeered the Triumph and are on their way. -Always fun to give this one a go. -I know, it's an amazing car, isn't it? Bless them for letting us try it out. See these houses here, I think they could be enhanced by an ant. Hopefully they're lived in by lots of yummy mummies who want that pram. Of course they'll want that pram. where David and Catherine await. Look at these two gorgeous creatures. -You don't disappoint with the trousers, David. -So lovely to see you. Hello. Lovely to see you. -Are you ready to go? Let's remind ourselves of who bought what. and also have five lots in today's sale. Our auctioneer is Bill Carrol. Before the off, what does he make of our teams' buys? The samovar. No, I like this. We sell samovars here quite a lot. But it's quite an unusual one. Silver-plated. And what of the ant menu-holder? Would you want it outside your restaurant? I think not. so it's hard to say, really. Oh, yeah! Thanks, Bill. Great moustache. accompanied by a dedication from Suzannah. Hey, that turns a nice little profit for them. 10. Are we all done then at £10? It was a bit of a mixture. HAMMER THUDS That lot's hung out to dry. But there's still everything to play for. -I think £10 was fair for this. inspired by Suzannah's Indian travels along with the Asian censer. Are we all done at £25 now? Are we all done at £25? Not the flyer they were hoping for, but it's just about in the black. Kate and Catherine's set of 1950s jug and glasses meets the room now. 20 on the net. 25, then? Are we all done at £20? 30, 30 on the net? No? -Yes, 30 on the net. -Kate, you've got a new career ahead of you. A crystal-clear winner there then. Well done, Kate. ..are we all done at £20? A modest profit means they're hanging on in there. -No. This is a disaster. Now it's Kate and Catherine's antipodean inkwell. 55 on the net? Are we all done? -They're on fire, these two. Are we all done, for the last time, at £110? Well done, you two, well done. All done at £50 now? Are we all done at £50? And that sells smartly to make a nice little profit. Of course, it's our old friend the ant menu-holder. -Are we all done at £85? Ooh! He's certainly proved himself. The ant I mean. -He didn't do too badly, did he? -I think that's pretty good. -I have to hand it to you. That was you. Suzannah and David's pram now, by Silver Cross. £10 anywhere for the pram? -Come on, come on. £10. 10! Yes. We've got to beat 10. Are we all done for the very, very last time, £10? That baby really went out with the bathwater. That's an unlucky loss. David, I'm sorry, I'm so sorry. -Help me, help me. Please help me. as their sizeable samovar is up next. Are we all done at £170? And that brewed up a very tasty profit for them. You were fab. Can you come with me on all of these Road Trips? Yeah, she is, isn't she? Suzannah and David began this trip with £400. They make a lovely couple, though, don't they? giving them a bumper total of £497.30. So, Kate and Catherine are victorious. You've done very well, you two. I can't believe it. -That was fun, wasn't it? -It's been so much fun. I just wish we could do it every six months. -It's been amazing, and you've been fantastic. Cheerio, girls. You've been swell! It is a journey into antiquity with historians Suzannah Lipscomb and Kate Williams. Paired with experts David Harper and Catherine Southon, they road trip from Bletchley in Buckinghamshire to an auction in London. There is also opportunity to hear how Mrs Beeton became the first 'domestic goddess' and why Luton played a critical role in the fashion world when hats were de rigueur daily wear. David and Suzannah gamble on a giant ant, while Catherine and Kate plump for a very large tea urn.